Your body acts like an efficient factory to keep the coenzyme NAD+ active throughout your life. Here’s how it works and how you can help the body make more NAD+. 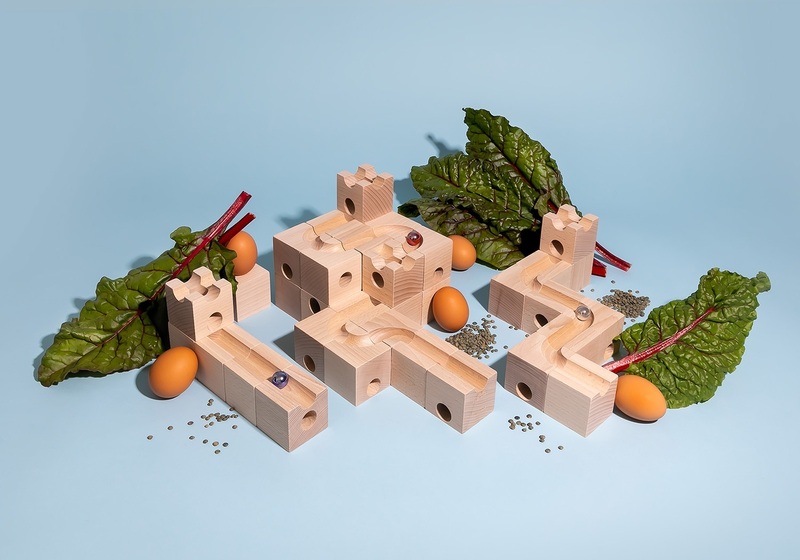 NAD+, nicotinamide adenine dinucleotide, is a coenzyme found in all living cells that’s required for fundamental biological functions at a cellular level. You literally can’t live without it. Nothing can. But NAD+ levels decline with age, and low levels of NAD+ are often associated with inadequate health. As a result, the scientific community has been researching how NAD+ relates to overall health and age-related diseases. NAD+ has earned its reputation by playing a role in the body’s central biological functions. For example, NAD+ is essential in the production of energy —in particular the Krebs cycle, which produces energy — and also works throughout the body to support mitochondrial function, oxidative stress defenses, cellular respiration, and DNA repair. Your body already makes and maintains NAD+ in various ways, specifically by converting food in your diet to NAD+. But since NAD+ levels decline with the aging process, it’s important to understand that you can increase your levels in other ways, too. Here’s what you need to know about how the body makes and maintains NAD+. When you’re driving a car, you’re probably not thinking about how it was made. But imagine the steps at play in an automotive factory: At the start, it’s simply a handful of separate parts — metal, head lights, radiators, and more — that, when put together with leather and stitching, becomes a fully functioning car. Each part goes through series of steps that transform it until ultimately, the car is in its final state: gassed up, shined, and ready to hit the road. The body’s function in making and maintaining NAD+ is a similar process. Your cells take certain raw materials—in this case a specific set of molecules that are NAD+ precursors—which go through a series of chemical transformations that turn them into NAD+ the body can put to work. Just as there are multiple ways to manufacture a vehicle that can hit the road, there are many ways NAD+ can be manufactured, too. NAD+ precursors are the raw materials from which your body makes NAD+. Each NAD+ precursor follows a pathway made up of steps that chemically convert the precursors to NAD+. Some pathways are more efficient than others, some provide more NAD+, some provide less, but all of them lead to the same thing: NAD+. It’s not entirely known why NAD+ declines, but what’s suspected is that NAD+-consuming enzymes, which provide various benefits to the body’s biological function and overall health, essentially “use up” NAD+. The older we get, the more NAD+ we need but the less we have. So even when you do get NAD+ through NAD+ precursors in the diet, you may need more, which is what NAD+ precursor supplementation can do. NA, Nam, and NR are each a variation of vitamin B3. Vitamins are organic compounds that the body needs to function and can access through whole foods, fortified processed foods, or supplementation. For example, vitamin B — of which there are eight types — is a vitamin we get from our diets in foods like beef, milk, eggs, yeast, lentils, spinach, and salmon. Look at the label of any regular baking flour and you’ll likely find niacin, or NA, listed as an ingredient. The U.S. government and international governments mandate that enriched flours include NA. This dates back to the early 1900s, when a fatal disease called pellagra was plaguing the American south. It was eventually mitigated by doctors who identified poor diets, specifically lacking vitamin B3s, were to blame. While the three predominant vitamin B3 precursors to NAD+ each provide their own benefits and all eventually get made into NAD+, one stands above the rest as the most efficient: NR. A 2016 study tested all three of these precursors in mice, concluding that NR was the most efficient of the three precursors. The efficacy of each precursor can be attributed to the pathway each takes to get to NAD+. 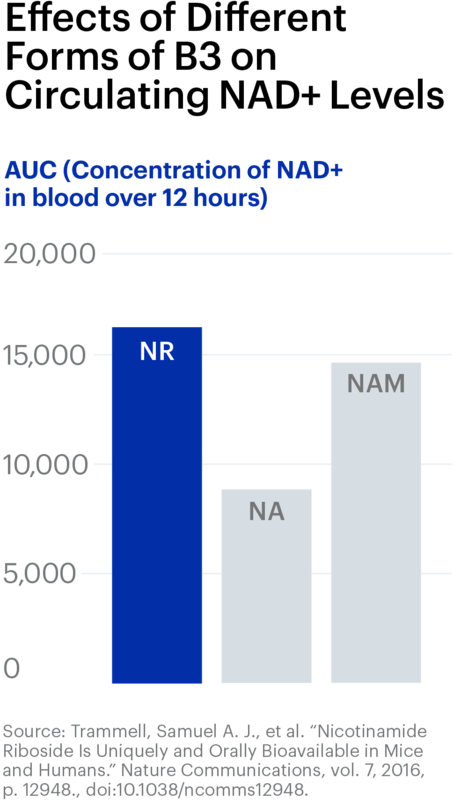 NR simply has the most direct route to NAD+, where Nam and NA take less productive pathways to become NAD+. If these pathways were the conveyor belts inside an automotive factory, each one producing the same car but with different steps, then NR’s pathway would be the conveyor belt that uses the least amount of machinery and electricity to get the most amount of cars. Tryptophan is another NAD+ precursor, but it’s the least efficient one, having to go through the most complex pathway before transforming into NAD+. Tryptophan is an amino acid that might sound familiar because it’s in turkey and is often mistakenly touted for making people tired after Thanksgiving dinner. It’s also the only primary NAD+ precursor that’s not in the Vitamin B3 family. Though humans need NAD+ precursors in their diets in order for their bodies to make NAD+, diet alone is not enough to keep levels steady as you age. Two human studies, one from 2012 and one from 2015, showed the link between NAD+ decline and age in human skin and the human brain, respectively. It’s also well established that NAD+ declines in animals, like roundworms, mice, and rats, as they age. The older we get, the more NAD+ we need but the less we have. Once you do consume something with an NAD+ precursor in it, whether via food or supplementation, it works its way through the body on one of the pathways. The De Novo Pathway works with the NAD+ precursor tryptophan, converting it into another molecule called quinolinic acid that eventually merges with one of the other NAD+ pathways, the Preiss-Handler pathway. The Preiss-Handler pathway, named for the scientists Jack Preiss and Philip Handler who discovered it in 1958, converts the NAD+ precursor NA into NAD+, but it also consolidates the tryptophan-turned-quinolinic acid to create NAD+ as well. There’s also the Salvage Pathway, which can lead to NAD+ in a variety of ways. There’s a lot happening in the Salvage Pathway at once. This pathway is the route for NR and Nam, which each become NAD+ by following different steps. 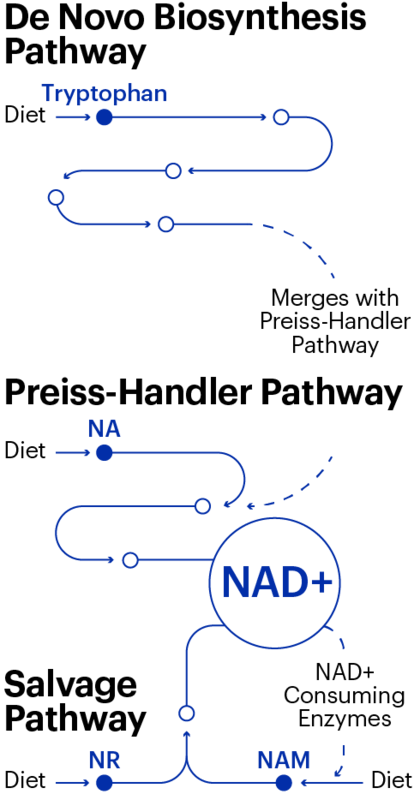 Nam gets to NAD+ through three steps, and NR gets to NAD+ in two steps. In fact, NR bypasses what’s called the rate-limiting step in the pathway, which Nam has to go through. The rate-limiting step limits the rate at which NAD+ can be produced. The Salvage Pathway also has a recycling element. NAD+-dependent enzymes, like sirtuins, use NAD+ by breaking off what they need of NAD+ and sending the rest — Nam — through the pathway to be recycled back into NAD+. If this part of the pathway were one of the conveyor belts in the automotive factory, it’d be like taking a car apart and breaking down the parts to make something else, then reusing the leftover parts to make another car. As we mentioned, diet alone is not enough to keep levels steady as you age. So supplements like Basis exist to boost your NAD+ levels. Basis is a combination of NR (remember, the precursor with the most direct route to NAD+) and pterostilbene, which can activate the NAD+-dependent sirtuins. You may be wondering why you can’t just take a pill made up of NAD+, and that’s because NAD+ is not bioavailable, meaning it can’t be taken orally and still survive the digestion process. NAD+ precursors survive digestion and convert to NAD+ via their respective pathways, with NR as the most efficient precursor to NAD+. Other ways to boost NAD+, like diet and exercise, have also been studied. We know that diets including NAD+ precursors are necessary for sustaining NAD+ levels, but when it comes to boosting levels as age depletes NAD+, the jury is out. One animal study testing the ketogenic diet — a high-fat, low-carb diet — in rats found an increase in NAD+ levels in the brain, but the data is scant. A handful of studies in rats and dogs have shown that low intensity exercise, swimming, and endurance workouts can increase NAD+ levels. The results are similar in humans, as exercise boosts an NAD+ precursor called NAMPT, ultimately leading to more NAD+ and also activating sirtuins. Another potential way to boost NAD+ levels, at least in theory, could be through gene editing. In a lab experiment, Harvard Medical School geneticist George Church increased levels of a protein called TFAM (Transcription Factor A, Mitochondrial) that can increase NAD+ levels. Using this technique could create a tailored mechanism for boosting NAD+ levels, but it’s unclear when, if ever, this would be available to, and safe for, humans. Overall, whether the body is getting its NAD+ supply from food, supplementation or both, the body is hard at work making, using, and maintaining its NAD+. And that’s because you can’t live without NAD+, but you can live better, for longer, if you have more of it. Knowing there’s a most efficient way to get your body more of it can put you on the path toward better cellular and overall health.